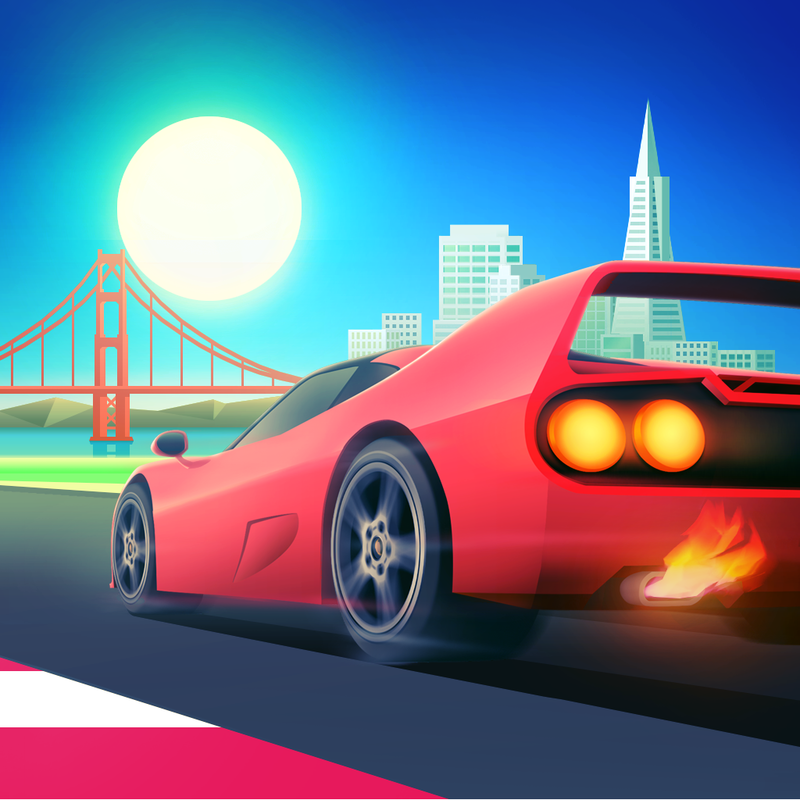 Horizon Chase - World Tour ($2.99) by Aquiris Game Studio is a gorgeous love letter to retro racing games, as it is inspired by the classic Out Run. 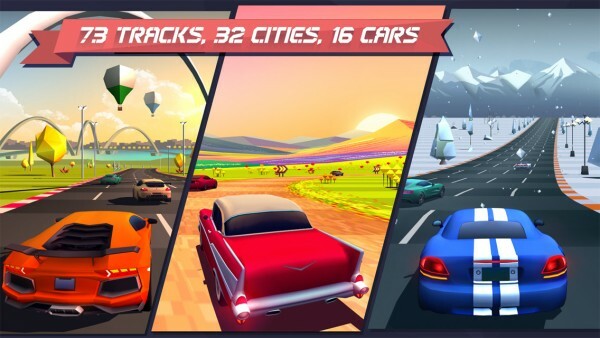 If you like other racing games such as Top Speed and Real Racing 3, but wish they had a dash of vintage in them, then you will love Horizon Chase. 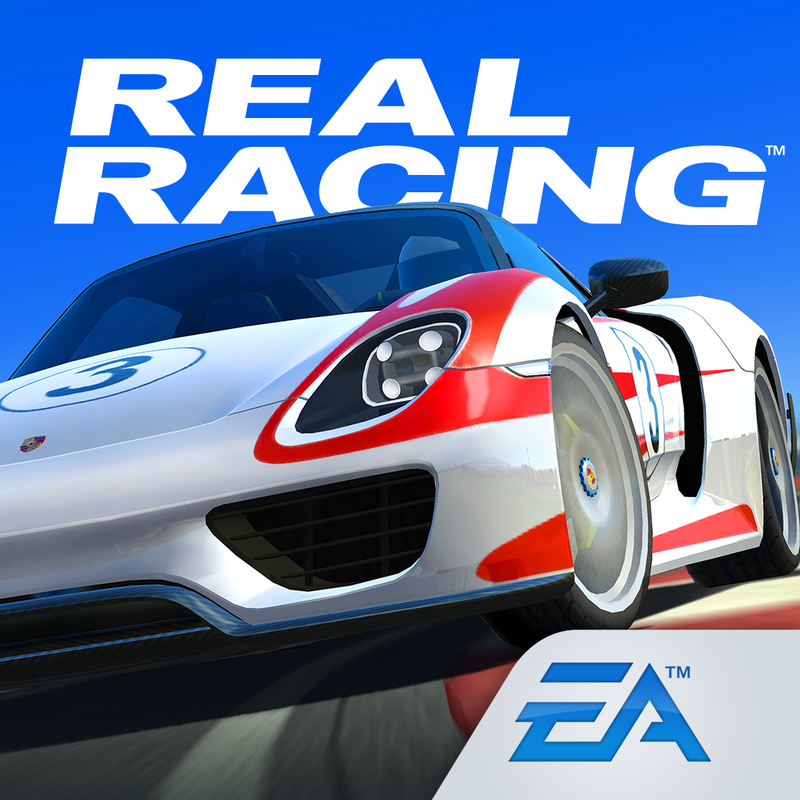 Personally, I’m not the biggest fan of racing games, because for the most part, I’m just not that great with them. However, one of my fondest memories of my childhood involved my Sega Genesis system and a little game called Super Monaco Grand Prix. I spent so many hours on this game back in the day because it was downright fun. I never played Out Run, but Horizon Chase reminds me of Super Monaco GP, so naturally, I had to get my hands on it when I first learned about it. And boy, was it ever so worth it. The visuals in Horizon Chase are stunningly beautiful. 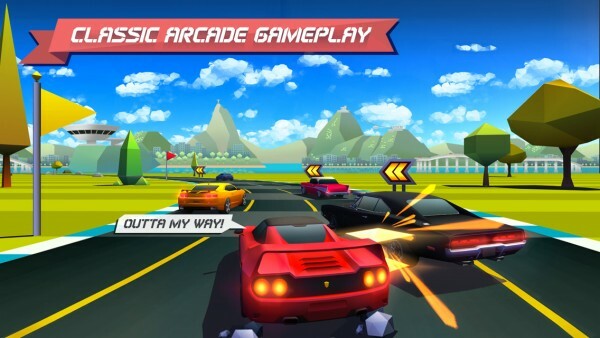 While it is a contemporary racing game, the developers have gone with a style that recreates the 16-bit look without sacrificing modern aesthetics. The various environments from all over the globe look realistic, but the jagged 3-D polygons used for trees and other landscape items will make you feel nostalgic. The colors are also a strong point of the game, as everything is bright, vivid, and rich. There was an interesting process to the color adjustment for each track and environment, which I recommend reading if you have time. Horizon Chase also makes use of dynamic day and night cycles during races, and even the weather can change drastically. Animations in the game are insanely smooth with no lag on my iPhone 6. 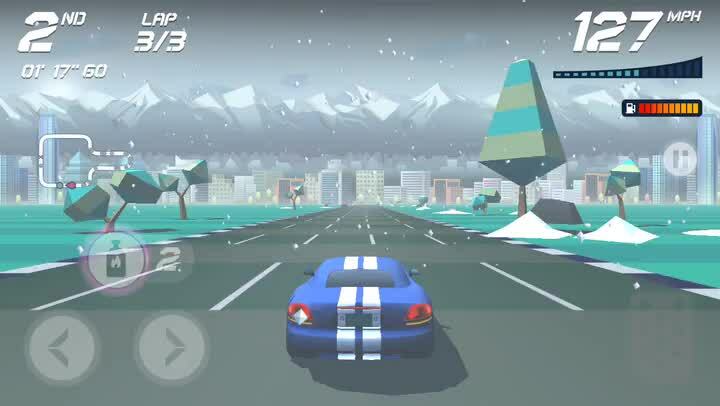 Another fantastic feature of Horizon Chase is the soundtrack. If you’ve played older racing games, then you’ll remember how intense they got when you’re genuinely into the race. 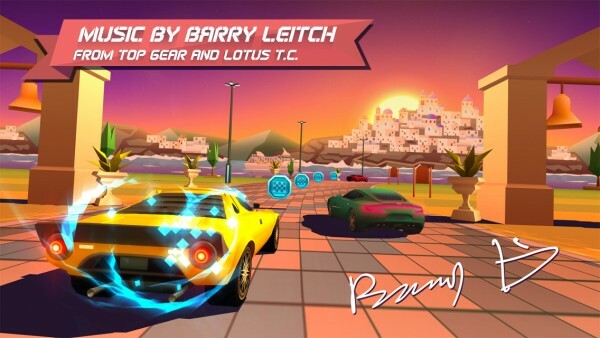 Horizon Chase’s soundtrack is composed by Barry Leitch, who is the musician behind other arcade racing games like Lotus Turbo Challenge, Top Gear on SNES, and Rush. To me, it sounds a bit like chiptunes, but with a touch of heavy metal. It suits the fast-paced action of the game nicely, to say the least. Horizon Chase has plenty of tracks (73), which are split up into eight cups from different locations from around the world. You get to see the stage layout ahead of time, so make sure to pick the best car for the job. If you do well enough, you’re able to unlock the bonus track of that cup, which can get you car upgrades or even a new car if you get third or first place. You can also get some cool surprises by ranking first place on every race, so make sure to put the pedal to the metal in this game. 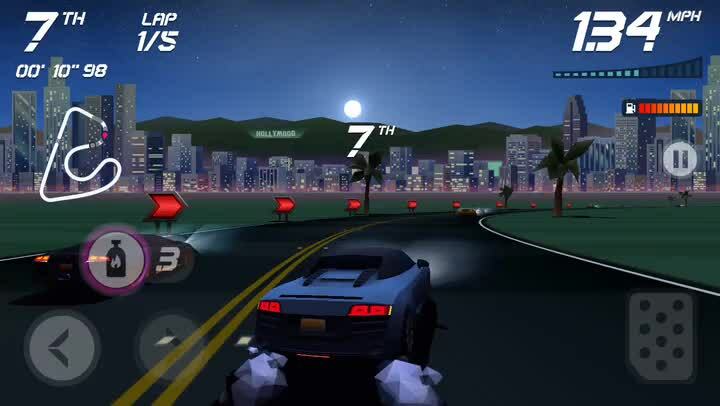 Controls in Horizon Chase are simple and intuitive, especially if you’ve played these types of racing games before. To accelerate your car, just press the button on the right side of the screen. If you release your finger, you will slow down, which is good for those cars that don’t have good handling for sharp turns. On the left side of the screen are buttons for turning left and right, and above that is the button for your nitro boost. The nitro starts out at three uses, but sometimes you may be lucky and find a refill for it on the track. Other options for the controls include inverted touch controls and support for MiFi gamepads. During each event, you can pick up blue “race tokens,” which you need for gaining access to the other racing spots. Additionally, each car has a different sized fuel tank — like in real life, if you keep driving, your gas levels go down. There will be gas containers on the track, and you’ll want to make sure to pick these up to refill the tank before it gets too low. At the end of each race, you get a certain number of points for ranking, as well as how many tokens you collected and how much fuel was left in the tank. Having more gas left means that you can possibly get more points than intended, which gets you the “Pro” stamp. I’m not sure about you guys, but I’ve been determined to get the gold on every track, so the replay value is high here. 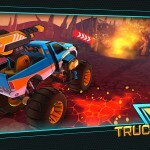 I’ve mentioned it earlier, but there are car upgrades and new cars that you can obtain for doing well. 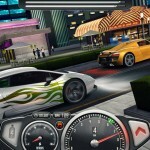 The car upgrades apply to whichever car you choose to use, as they seem to be tied to the player, not the car itself. Each car also has it’s own specialties and weaknesses, and since you can see the stats for each vehicle before going in, make sure you pick the right car for the terrain. Depending on what you use, even if you’ve cleared it already, it can be an entirely new experience. 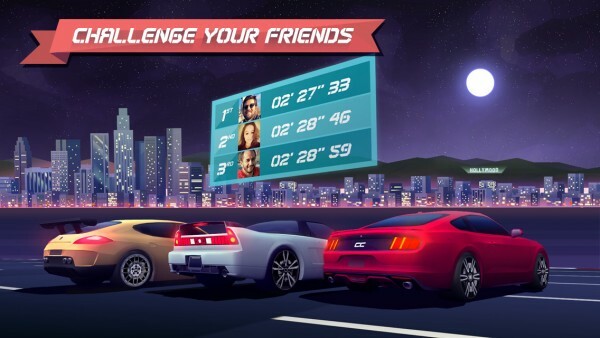 Since racing games are perfect for competing against friends, there is full Game Center support for leaderboards, and you can also log in to Facebook to compare scores. I do wish that there were some achievements to obtain, but it’s not a big deal. Even though I am not always into most racing games, I have to say that Horizon Chase is one of my favorite games of the year so far. The graphics are artistic and magnificent, the music is a quirky blast from the past, and the controls are easy enough for anyone to pick up. The gameplay is challenging, there is a ton of content for the price, and replay value is high. Seriously, there is nothing I don’t like about this game, and I’ve had a hard time putting it down since I bought it last night. 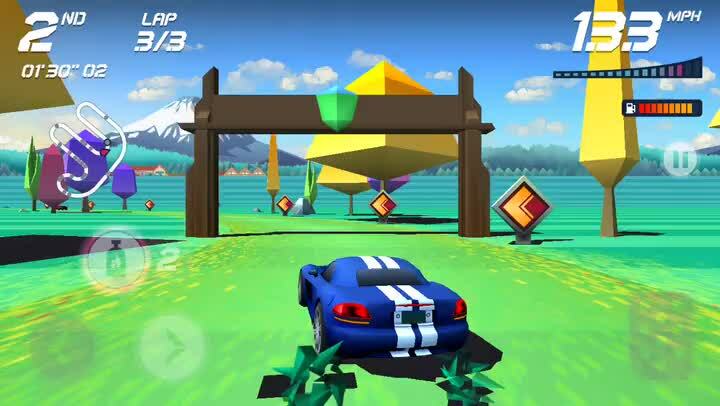 I highly recommend giving Horizon Chase a test drive if you are a fan of vintage homages or racing games. 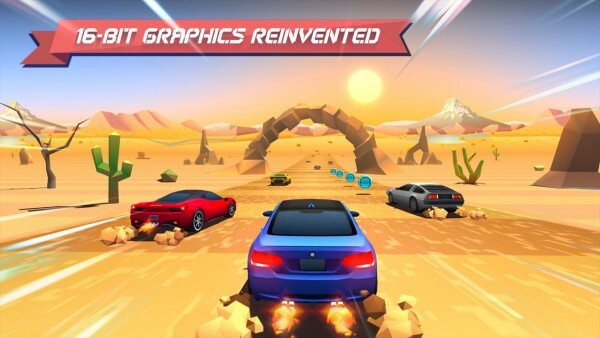 Horizon Chase is on the App Store as a universal download for $2.99.